Well, we bid a fond adieu to Claire Olwen Stewart, our first Artist in Residence, as she wends her way to Montreal to continue her art studies. Her final exhibition, Vignettes was a huge success drawing many young people to the Chester Art Centre to see her beautifully crafted ceramic pieces. We wish her well and will be glad to see her return to Nova Scotia this summer. Claire's residency was sponsored by the Chester Art Centre through the funds raised by the Donald Curley Lecture Series and friends of the centre. We look forward to some changes to the presentation format for the lecture series this year so stay tuned…! There’s a first for everything, and Claire Stewart is it – the first Artist in Residence at the Chester Art Centre. Claire is an emerging artist and designer, a graduate of McGill with a Certificate in Graphic Applications for Desktop Publishing from Concordia University and a fascination with ceramics. She began her studies in clay at the Visual Arts Centre of Montreal in 2014, then moved to Nova Scotia two years ago to continue her studies at the Lunenburg School of the Arts. 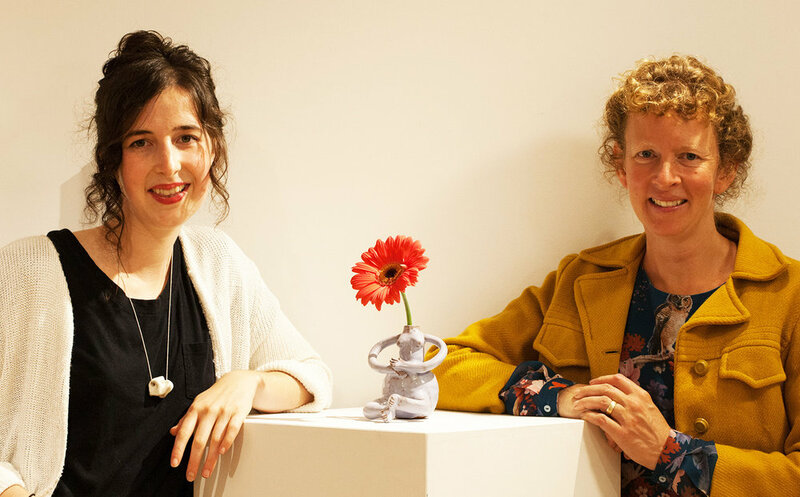 Sharing a studio with Teresa Bergen, the well-known and highly regarded Chester ceramicist, Claire will spend the next two months working on her Pattern Project, exploring the “female gaze upon the female form”, in relation to abstractions of naturally occurring botanical shapes and pattern. She’ll be using paper cut stencil techniques to explore ways of transferring patterns to large clay tiles which could then be applied to larger sculptural shapes that blur the line between functional objects and decorated sculptural forms. Claire will also be sharing her talent and ideas with the community at large. She’ll be giving an open studio free workshop for kids called “Creating with Clay”, from 9:30 am to 12:30 pm on Saturday, October 20th at the Chester Art Centre, 60 Queen St. in Chester. Claire will give 10 children hands-on help and demonstrations as they learn to decorate a tile using tracing, engraving, paper cutting and slip application. All levels of skill are welcome, children 13 and under will need adult accompaniment. At the end of her residence, Claire will also be offering an exhibition of her latest works. This first artist-in-residency is a dream come true for the Chester Art Centre, made possible by the Donald Curley fund, established in memory of the world-famous Chester artist upon his death in 2009. Funded by contributions from friends and family, as well as the proceeds from the Donald Curley lecture series held every winter at the Art Centre. “This residency honours Don’s legacy as an artist who loved to teach almost as much as he loved to paint,” says CAC Vice-Chair Trudi Curley, who chairs the committee which selects the Artist in Residence. Application forms for next year’s residency will be available soon on the Art Centre’s website. Claire Stewart (left) and Teresa Bergen (right) at Chester Art Centre "Meet and Greet" for Claire.